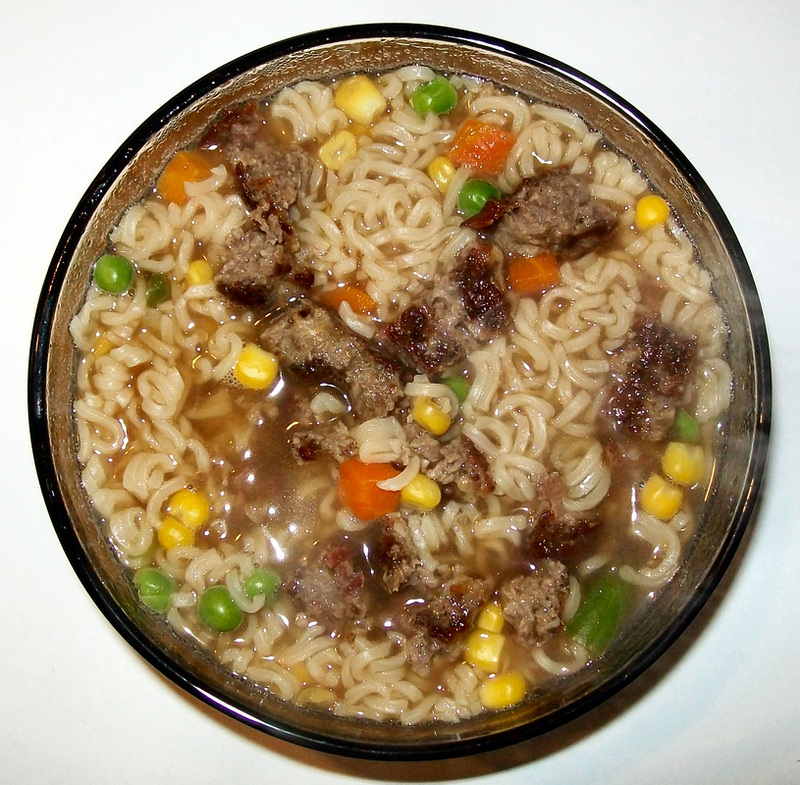 I offer you 5 Great ways to make Ramen Noodles more interesting. Because, we should all know how to eat for less, in ANY economy. 1. Steam, peel and de-vein fresh shrimp. Or add steamed clams, oysters or mussels and set aside (see tips), reserving stock. Add enough pure water to the stock to equal 2 cups and bring to a boil. Add noodles and cook for 3 minutes. Remove from heat and add the flavor packet if desired. 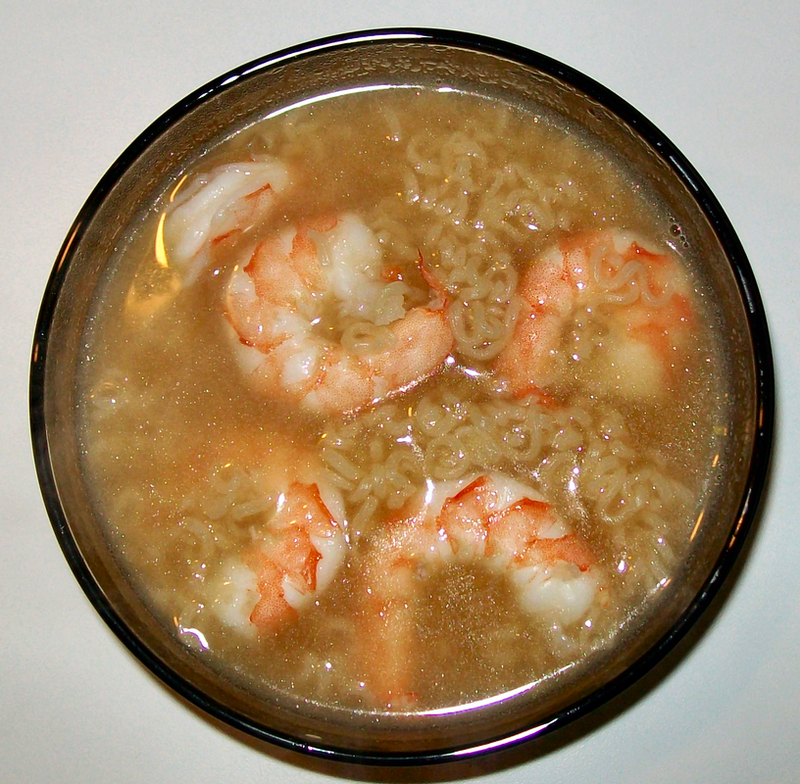 Stir the seafood of choice into the noodle soup, or drain and plate the noodles and arrange the seafood on top. Serve with lemon wedges & parsley. 2. Substitute Shrimp with steamed fish & vegetables. Steam vegetables with fish in the same steamer basket. Follow the cooking instructions above, including the reserved stock. 3. Follow cooking instructions for noodles. Add 5 ounces of cooked chicken or turkey breast (chunk, cubed or shredded). Season with Parsley, Curry and Turmeric. Stir into noodles hot from the stove and let cool before serving. 4. Follow cooking instructions for noodles. Add cooked/chopped hamburger or cubed steak. Season with Soy Sauce or steak seasoning, to taste, if desired. Steamed veggies as a side dish or (frozen) added to noodles while cooking. 5. 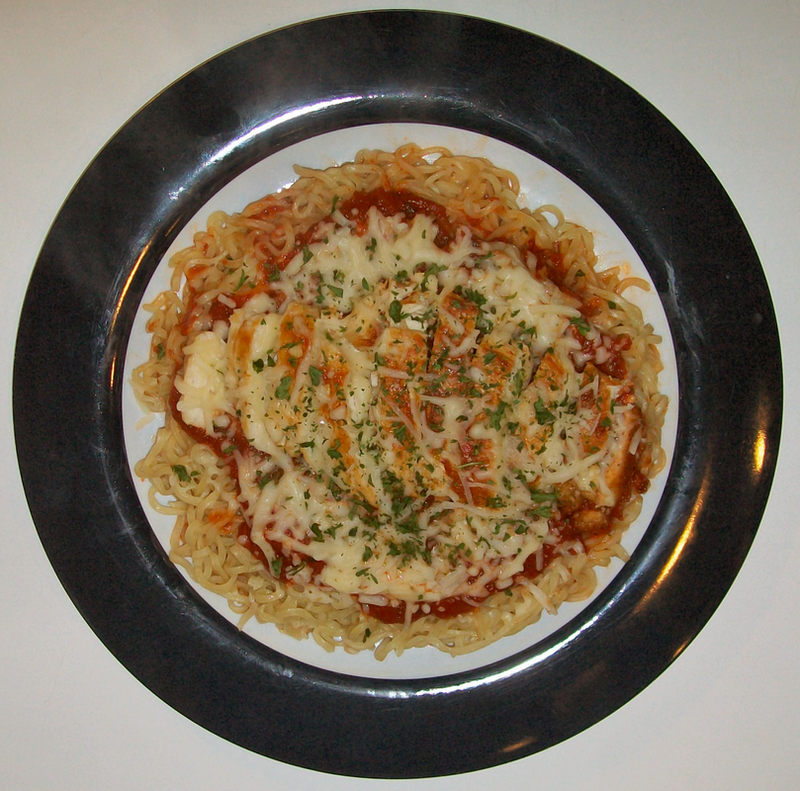 Heat spaghetti sauce, spoon over cooked/drained noodles and serve with pan fried skinless/boneless chicken breast. Top with shredded Parmesan cheese and parsley. Optional: serve fresh picked, steamed or boiled vegetables as a side dish. 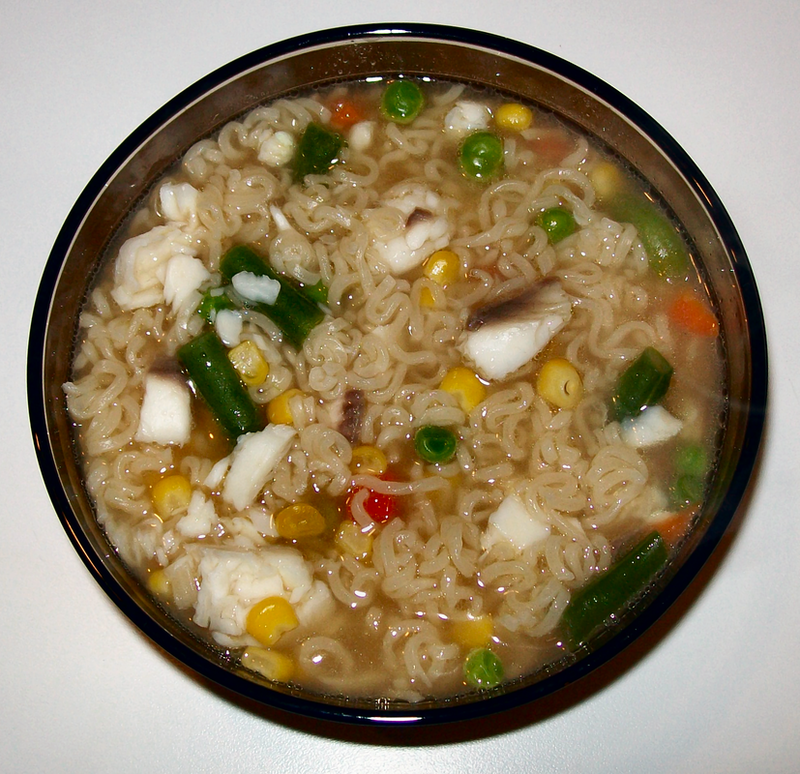 * Drain noodles, reserving broth. Plate and serve with meat & vegetables as sides or spooned on top. Serving broth separately in a sipping bowl. * When steaming fresh shellfish, filter the reserved stock to remove sand or grit. * When using canned/pre-cooked or smoked clams, oysters or mussels, stir into noodles hot from the stove and let cool before serving. * Using canned Tuna or chicken in water? Save that water and add to the two cups needed for cooking noodles. 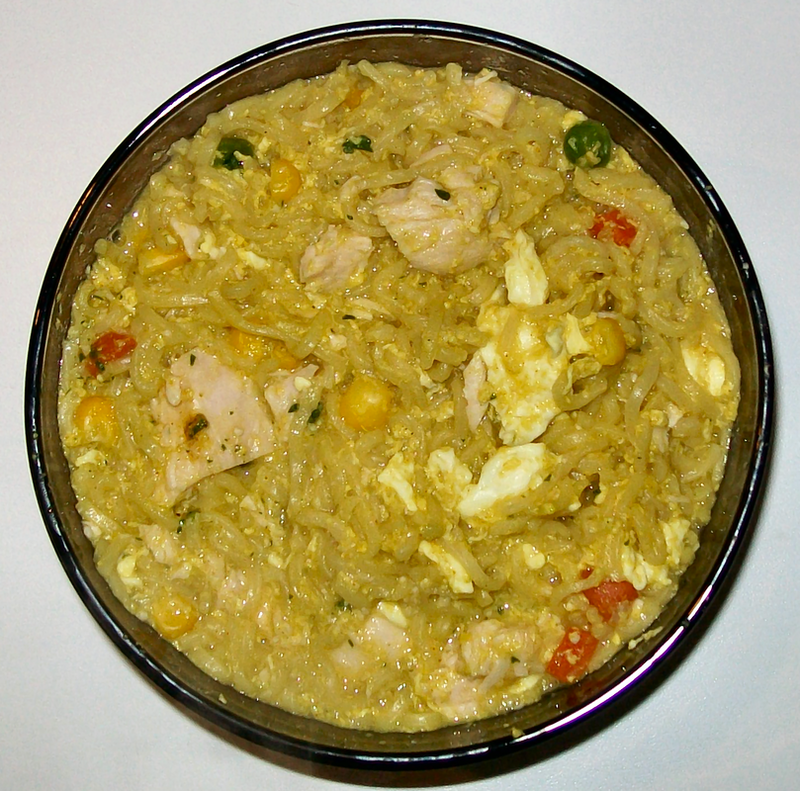 * Stir in a raw egg to cook for the last three minutes, when using chicken or turkey breast. * Brightly colored vegetables add vitamins, minerals and fiber. * Vegetables cut thin or cubed cook faster. * Add approximately 1/2 cup of vegetables per pouch. * Add chopped Celery instead of salt. * Include boiled or steamed Soybeans or Snow peas as a traditional Oriental side dish. * When making the Parmesan version, cook noodles less than 3 minutes until al dente. * Do not cook dead shellfish! * Do not cover steamed Shrimp or shellfish with foil to retain heat. They will continue to cook and become chewy.